Hundreds of thousands of people worldwide have found the Body Ecology diet after struggling with candida, chronic fatigue, depression, weight problems, early aging, ADHD, autism, hormone imbalance and auto-immune disorders. Body Ecology offers a back-to-basics approach to restoring health and vitality. The digestive system is intimately linked to the immune, endocrine, circulatory and central nervous systems. Profoundly affecting all these interlocking systems is an amazing world of benevolent bacteria. The Body Ecology Diet and associated products are all specifically designed to help cultivate, nourish, cleanse, and repair this abundant inner ecosystem. 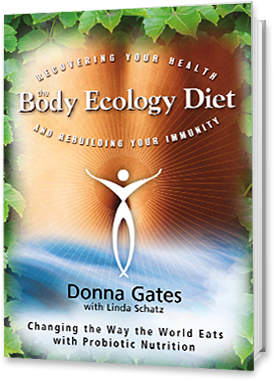 After 25 years of studying Eastern healing systems and Western fad diets, international best-selling author Donna Gates, M.Ed., ABAAHP, world-renowned teacher and lecturer, discovered the key to health and longevity... a flourishing inner ecosystem living inside your intestines. Based on a deep understanding of how the digestive tract truly affects how you look, feel and even think, the Body Ecology Diet offers a gluten-free, sugar-free, probiotic-rich way to eat that will change your taste buds and your life forever.